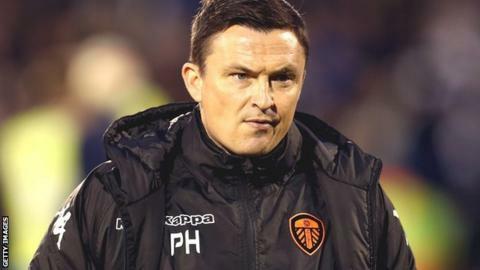 Leeds United have sacked head coach Paul Heckingbottom after only four months in charge, saying they want to bring in a "more experienced" manager. The 40-year-old won four of his 16 games, having left Barnsley to replace Thomas Christiansen on 6 February. Leeds ended the season 13th in the Championship. They will start the season with a new manager for a fifth successive year and Argentine Marcelo Bielsa is reportedly the favourite to succeed Heckingbottom. Managing director Angus Kinnear said the club wanted to make a "quick appointment". Quiz: Can you name Leeds' 10 managers since 2012? "Our objective is to bring in a head coach with more experience who can help us reach the goals we have talked about since we became custodians of the club last summer," said Kinnear. "Paul came to us during a difficult period in the season and has conducted himself in an exemplary manner despite results not going as any of us had hoped,"
Whoever takes over will become the club's 10th boss since 2014 and only one of Leeds' previous eight managers, Garry Monk in 2016-17, has lasted a whole campaign in the role. Leeds sacked Dane Christiansen in February after a disastrous start to 2018 saw them knocked out of the FA Cup by League Two Newport and fail to win any of their first five league games of the year. Heckingbottom was a surprise appointment given he had only extended his deal with Yorkshire rivals Barnsley the previous week and the Oakwell club said they were "shocked" by his departure. He could not arrest the club's slide down the table, winning just one of his first eight games, and the campaign ended in controversy with a much-criticised post-season tour of Myanmar arranged by owner Andrea Radrizzani. Argentine Bielsa has been widely reported as the favourite to replace Heckingbottom. The 62-year-old is highly regarded by both Manchester City boss Pep Guardiola and Tottenham manager Mauricio Pochettino, with the latter calling him his "football father". He has spent time in charge of Argentina, Athletic Bilbao, Marseille and Lille but has been out of the game since being sacked by the French side in December. Can you name Leeds' last 10 managers? Read more on Leeds United: Can you name 10 managers of Championship side since 2012?